Boothby Cottage in Welton le Marsh, near Spilsby, Lincolnshire sleeps 5 people. Boothby Cottage near Spilsby is situated in the heart of the village of Welton le Marsh and with a stream running through the garden; this superb detached cottage provides a lovely base from which to explore the area, or simply sit back and enjoy the peace and quiet. For your comfort, the owner has thoughtfully provided bathrobes and slippers. Cyclists and walkers will enjoy exploring the local lanes and countryside. The market towns of Alford, Louth and Spilsby are all within half an hour, and Horncastle which is well known for its antique and collectables shops is 7 miles. To the east, the traditional seaside resort of Skegness is 8 miles away with its sandy beaches and nature reserve and is always worth a day out, and Lincoln which is well known for its cathedral and castle is approximately a 40-minute drive to the west. There is a traditional country pub with a restaurant a short walk away. The beach is 8 miles from Boothby Cottage near Spilsby. With the shop 3 miles, and the pub & restaurant are ¼ mile from Boothby Cottage. Living/dining room: With wood burner, 42 Freeview TV, DVD player and CD player. Kitchen: With range with electric oven and LPG hob, microwave, fridge/freezer, dishwasher, washing machine and tiled floor. Bedroom 3: With double bed. Pull-out bed for flexible sleeping arrangements, available on request. LPG central heating, LPG, electricity, bed linen, towels and Wi-Fi included. Initial logs for wood burner included. Travel cot, highchair and stairgate available on request. Welcome pack. Large enclosed lawned garden with sitting-out area, garden furniture and barbecue. 2 small dogs welcome. Private parking for 3 cars. No smoking. Please note: There are 12 steps from the parking area to the garden and there is a stream in the garden, 20 yards away. Holidays at Boothby Cottage run from Friday to Friday. Pets allowed at Boothby Cottage. For a better idea of where Boothby Cottage is, you can see Boothby Cottage on the map below. 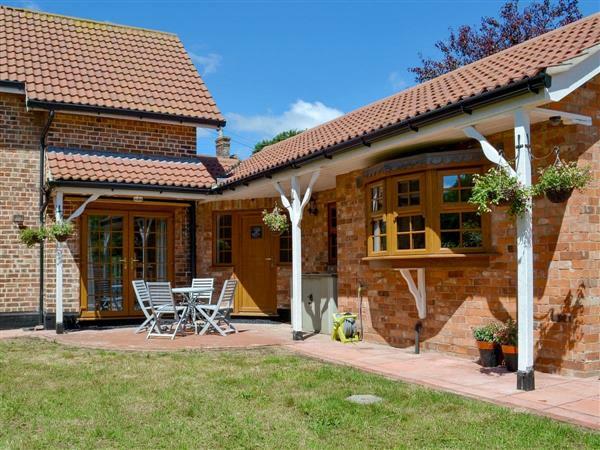 Boothby Cottage is in Lincolnshire; should you be on the lookout for a special offer, you can find all the special offers in Lincolnshire. It's always worth checking to see what is on offer at the moment. Do you want to holiday near Boothby Cottage (UKC2139), you can see other cottages within 25 miles of Boothby Cottage; have a look to find your perfect holiday location.